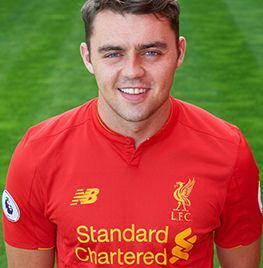 Connor Randall is a local-born right-back who has been at the Academy since he was six years old. An England youth international, he was previously captain of the U18s. Randall made an appearance for the first team at the end of 2013-14 when he featured in the friendly win at Shamrock Rovers. Randall relishes attacking teams down the right flank and he is always looking to use his strength to carry the ball into opposition territory and burst into the penalty area. The youngster also possesses a great passing range and the ability to pick the perfect pass. The Scouser was handed his debut by Jürgen Klopp when he featured at right-back during the Capital One Cup victory over AFC Bournemouth. It was announced on July 28 2017 that Randall would be spending the 2017-18 season on loan in Scotland with Hearts. On August 23 2018, Randall went on loan to League One outfit Rochdale before he unfortunately suffered a fractured cheekbone which cut the temporary spell away short. Click here to read more about Randall.